Breast Cancer Awareness Month hits close to home for Arizona Cardinals wide receiver Larry Fitzgerald, who lost his mother Carol to the disease back in 2003. Breast Cancer Awareness Month hits close to home for Arizona Cardinals wide receiver Larry Fitzgerald, who lost his mother Carol to the disease back in 2003. 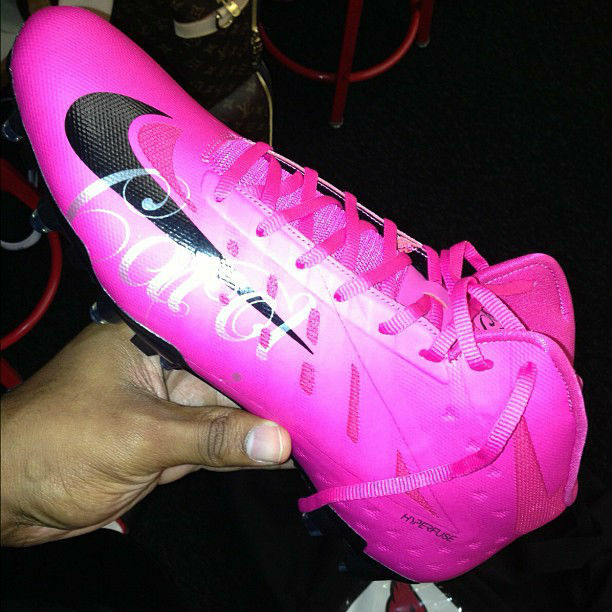 For games played during October, Larry will be lacing up these special edition pink Vapor Talon Elite cleats, which Nike customized with "Carol" script on the lateral side and tongue. Keep an eye out for the "Carol" cleats when Fitzgerald's undefeated Cardinals travel to St. Louis to play the Rams tomorrow night.